Rose Oxide is the perfect aroma chemical for vibrating, elegant and pulsating rose scent. It is used in many fragrances and is highly impactful high cis quality, fresh, radiant and powerful. It is ideal for all kinds of compounds, used as an ingredient in cosmetics, personal care products, fragrances, cleaners, detergents, home care, perfumes etc. The molecular formula of rose oxide is C10H18O. It is organic compound of the pyran class and monoterpene class. It is a fragrance found in roses and rose oil. Rose oil compound has a, cis- and atrans-isomereach with a (+) - and (−)-stereoisomer, but only the (−)-cis isomer (odor threshold 0.5 ppb) is responsible for the typical rose (floral green) fragrance. It also adds to the flavor of select fruits like lychee and Gewürztraminer. Rose oxide is industrially produced starting with photooxygenation of citronellol to give the allyl hydroperoxide. It is then reduced to sodium sulfite to provide the diol. The ring closure with sulfuric acid creates bothe cis- and trans-isomers in equal amounts.The name Rose oxide comes to this compound because it has the same fragrance as rose or rose oil. Rose oxide is a compound, an organic compound and has the monoterpene and pyran class. Rose oxide is a flavor rich component and can be seen in some essential oils like the Bulgarian rose oil and in roses. 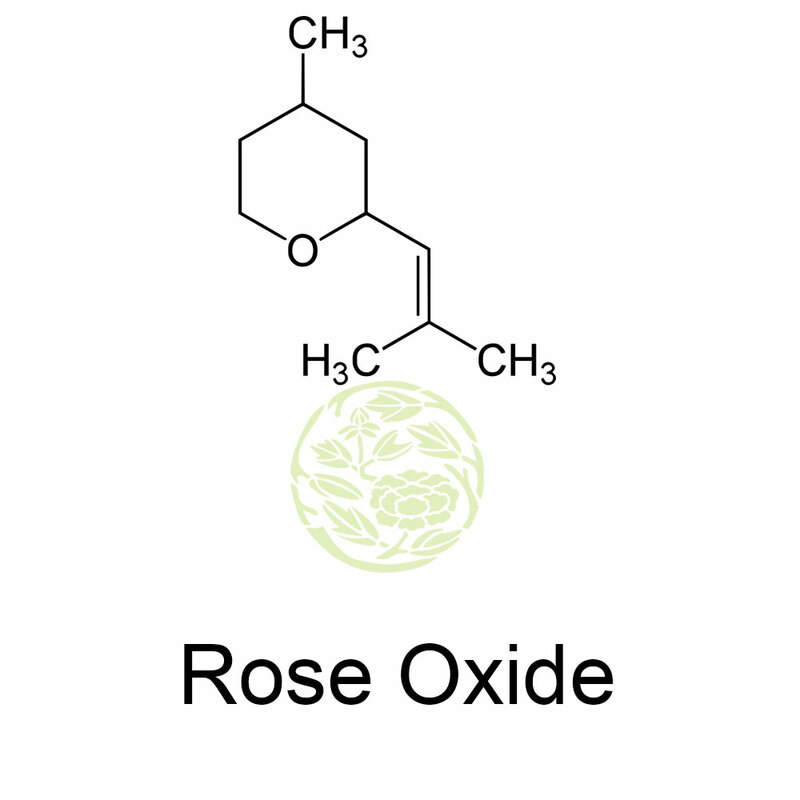 Rose oxide is one of the important fragrance materials in creating rosy notes for perfumes. This monoterpene is an interesting flavor compound for food and flavor industries because of the floral notes. 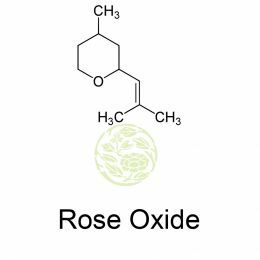 Rose oxide is widely used as a flavoring agent in perfumes, cosmetics, detergents and insect repellents which are advertised as biosafe. Rose oxide is chiral monoterpenoid ether found in little quantity in essential oils of plants like Bulgarian rose, Geranium and Damask rose and provide much to the unique bloomy green top notes of these essential oils. Biotranformation of citrolellol into rose oxides has been taking place and it has been studies for many other microorganisms. Biotechnical production using citronellol as precursor in biotransformation has been popular as an alternative to chemical synthesis and extraction from natural sources.